All of our chrome trim is crafted from top-quality stainless steel or ABS plastic and backed with auto-grade 3M adhesive for a permanent installation. All chrome and stainless steel products come with a lifetime warranty. 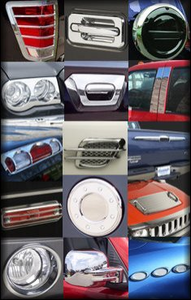 Chrome pillar posts, door handles, mirror covers, fender trim, gas doors, grills, headlight and taillight trim, window sills and exhaust tips are available for most vehicles. Contact a sales representative for details.